Before Plan B and the $35,000 question, Darrell Stanton came up on Real and ripped Bay Area spots with an uncommonly loose-limbed style that nobody else really had then or since. Setting aside debates over the moniker and worth of the ‘forward flip’ — he could do them in lines — there is something about nearly every clip in this part from Real’s ‘Roll Forever,’ a full-length offered up for free in the days when that was achieved by packaging rainbow-reflecting DVD discs with paper magazines sent through the U.S. Postal Service to subscribers’ homes. Man-for-all-seasons Darrell Stanton spins his switch 180s late, sits on his window-ledge backside tailslides for a good long while, switch bigspins double sets and wow, that arm on the nollie frontside noseslide. For however many years he’s been out of the limelight now Darrell Stanton, who crushes three tricks down the SF Clipper hubba here, could still make a credible claim to the title for that spot, what with his Transworld part two years earlier. Alex Gall careened into the frame at a time when a dude could get a wheel ad and a board in a magazine along with a 411 part and immediately become a factor. Jamie Thomas hitched a VX1000 to this dude’s blazing backside 5-0s and barely hanging-on squat landings to get out this ‘Wheels of Fortune,’ which came in a couple flavors, before the misanthrope knowed as Trainwreck hopped to J Strickland’s Bootleg venture and then for the board-company blip Young Guns before his pro arc fizzled. But while he was hot, he was hot. The 411 part is Zero edited to the Mountain Dewiest cut-at-the-snap levels, with Alex Gall screeching backside tailslides down hubbas, fakie ollieing onto the Arco rail six ways to Sunday and 5-0ing long handrails, real visceral skating that sort of personifies the triple-stud spike belt that’s ripped across the sidewalk at the beginning of the park. 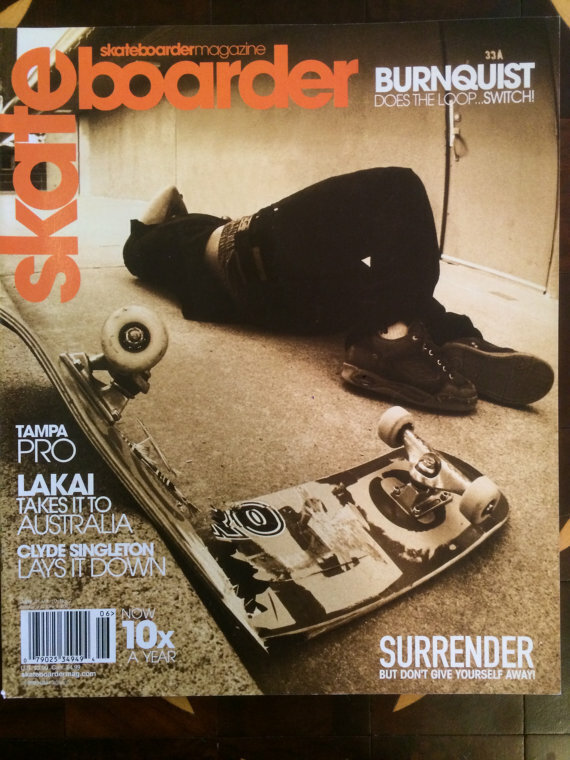 Let the record reflect that Alex Gall’s brief time at the top of the industry heap also produced what remains one of the best non-trick magazine covers. Danny Garcia’s curtains-drawing part in ‘Mosaic’ somewhat was the Guy Mariano ‘Mouse’ part to Stefan Janoski’s preceding Eric Koston position, but by the time Habitat came with ‘Inhabitants’ four years later Danny Garcia was transitioning from hubba-gracing gentle giant to brooding, button-up troubadour. His flick though remained among the best on the market, regular, switch, toe or heel, and his early embrace of colourful socks and surf-loose trucks extends this part’s shelf life such that someone could release it today and generally remain in step with where things stand, similar to former Lakai compadre Anthony Pappalardo’s ‘Fully Flared’ section. Few dudes then or now can hand a switch heelflip with such grace, and dudes still aren’t that much doing frontside shove-it backside nosegrind reverts both regular and switch in the same parts. Even as he turned up the lilting psychadelia and the cruising, and dialed back on the thunder gaps, you can now and then glimpse Danny Garcia’s All City roots, like in that loading dock line with the switch shove-it nosegrind revert. From the dungeons of the dearly-missed Joe Perrin’s body of work comes this snapshot in time of Ryan Nix, after his seven-minute Bootleg 3000 opener but before he went full Spring Breakers, where his skating was peaking. This ender part in Westside’s seminal ‘Good Life’ vid cribs some musical supervision from the Blind section in ‘Trilogy’ for the deeply Floridian Ryan Nix to push some heavy frontside noseslides, ride out a window-rattling switch 360 flip, and step to celebrated spots across Philadelphia and other eastern seaboard locales; did anybody else hit that Boston gap to rail besides PJ Ladd? Whereas much is made of the current ‘anything goes’ era in terms of tricks and approach, in the five-panel heyday of 2006, Ryan Nix put out there a part with both a switch varial flip and a street switch stalefish. You are currently browsing the boil the ocean blog archives for June, 2017.